Chemicals such as those used for scent marking, or visual cues such as color badges, can transmit information pertaining to different aspects of individual, group and species recognition and attributes. Here, we show that complex acoustic cues, such as calls also have the capacity for such information transfer. Although songs are usually attributed to birds, rock hyraxes (Procavia capensis) engage in a rich and complex vocalizing behavior that we term ‘singing’. Previous studies on various species have shown that a specific vocalization can closely reflect a specific attribute. 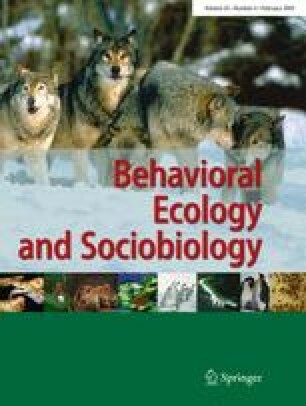 Using a series of multiple regressions, we show that a single complex vocalization by the adult male rock hyrax closely reflects numerous individual traits, possibly encoding various types of biologically important information (multiple-messages hypothesis). Our study reveals that hyrax songs provide accurate information regarding body weight, size and condition, social status and hormonal state of the singer. We also show that these independent data are sent in a sequential manner, a pattern that probably allows a better partition of the messages embedded in the song. Our results imply that animals, through complex individual vocalizations, can potentially advertise multiple individual attributes in the same manner as that produced by chemical scent marking. The online version of this article (doi: 10.1007/s00265-008-0693-2) contains supplementary material, which is available to authorized users. We are obliged to B. Sanzenbacher, I. Aravot, and E. Tauber for their extensive help with the trapping of the hyraxes, as well as to the many project students, field guides and park rangers who helped in the field. We wish to thank the Nature and Parks Authority for permission to work at the Ein Gedi Nature Reserve and the Ein Gedi Field School for their hospitality and logistic help. We especially wish to thank G. Koren and T. Karaskov for teaching us the hair-testing protocol. Finally, we are grateful to H. deVries for his assistance with the rank determination, to C.K. Hemerlijk for sharing with us the Matrix Tester program, to N. Amir for helping with the formant analyses, to A. Lotem, B. Lyon, G. Roemer for their critical input, and to N. Paz for editorial assistance. This study was supported by two grants from the Israel Academy of Sciences and Humanities (ISF 577/99 and 488/05).